With summer now officially upon us, many folks are starting to burn up vacation days for things like extended weekends, camping trips, or extra days for the summer holidays to spend with their family. That got us thinking about vacation homes, and the number of second home loan locks that have occurred in the last year, and the interest rates associated with those. We pulled some data from Marksman® to see what we could discover. The first thing to notice is that when it comes to location, rate isn’t much of a factor. 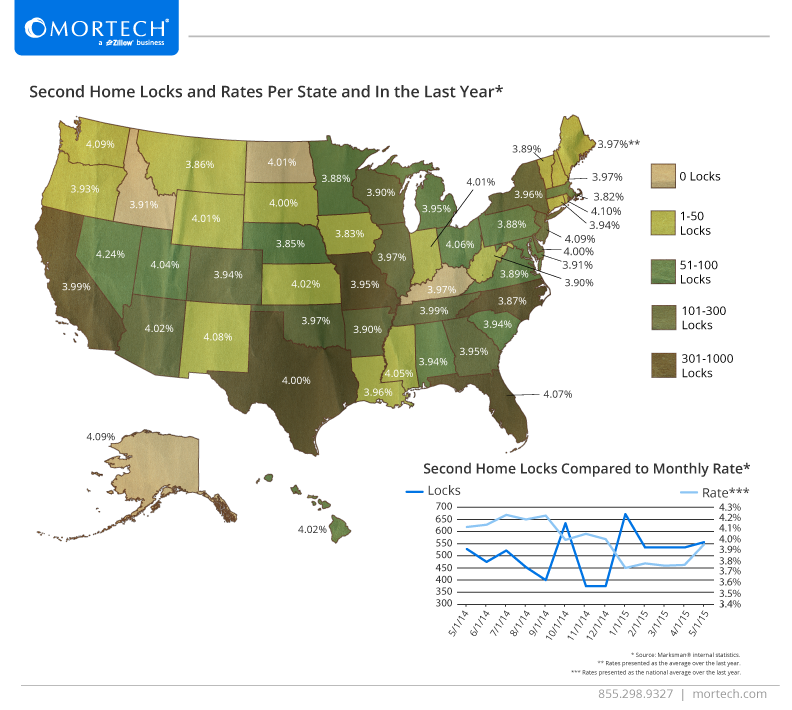 Of the top five states with the highest second home lock volume, four have a rate of 3.95% or higher. Only North Carolina, which has the highest amount of second home locks in the country, is below 3.95%, and actually has one of the lowest average interest rates for second home loans over the last year. Secondly, while rate doesn’t appear to matter as much when it comes to the location, it certainly appears to be a factor nationally, much more so than seasonality. While it wouldn’t be unfair to assume that locks peaked during time periods that are generally more popular for people to use their second homes, the amount of locks nearly mirrored that of the fluctuating rates, peaking in October of 2014 and January of this year, when second home rates saw large drop offs. On the flip side, as rates saw an increase, or a point in which a relatively high average rate was sustained, rates either dropped or stayed at a consistently lower number. As these rates continue to fluctuate, and second home locks with them, you’ll want to ensure that you’re pushing the best rates and products to your customers. With the help of Mortech and Marksman, your business can do all of that, as well as gain valuable tools for things like streamlining your secondary desk and expediting internal communication and practices. Find out more about what you’re missing with Marksman today.